Alabama didn’t end up with much oceanfront, but the towns tucked along Mobile Bay provide enough culture, architecture, and good food that visitors don’t miss the white sand. Fairhope, on the eastern side of the inlet, is just five hours or so from Atlanta and in some ways has more in common with Highlands, North Carolina, than sand-and-surf destinations like Panama City Beach. For couples like us, it presents that elusive combination of golf and gallery-hopping. “We’ve often been compared to Carmel, California,” says Kiefer Wilson, whose wife, Karin, is the third-generation owner of Page & Palette bookstore and adjacent coffee shop Latte Da. Both coastal villages have quaint downtowns with dozens of independently owned fashion boutiques, antiques stores, and restaurants, plus long-standing reputations as art meccas. The annual Fairhope Arts & Crafts Festival in March draws some 300,000 attendees, but local galleries and the Eastern Shore Art Center attract art lovers year-round. Part of the town’s allure is its literary history. Among Page & Palette’s wooden shelves of bestsellers, used books, and art supplies is a section promoting local writers like Fannie Flagg, Winston Groom, Jimmy Buffett, and Rick Bragg. These authors and others have given the area a reputation as a place to write and think. But Fairhope isn’t all highbrow. Its scenic pier overlooking Mobile Bay, often called the city’s “town square,” is a great place to fish. Walking trails along the water also offer inspiring views, while bike rides through the historic area provide a tour of coastal cottage and French Quarter–influenced architecture. In fact, there’s plenty of NOLA energy in Fairhope, which is 160 miles east of New Orleans. The Gumbo Shack has been featured on Food Network. A shopping-and-dining district called the French Quarter has the familiar architecture and iron railings of Louisiana. Don’t miss the beignets inside the tall, filigreed green gazebo at Panini Pete’s. And Fairhope’s Mardi Gras is a family-friendly version where krewes toss MoonPies instead of beads. A home base for Fairhope visitors is often the four-diamond Grand Hotel, a few miles south on Point Clear. The historic inn—built in 1847 and used as a hospital during the Civil War, then as a training base in World War II—has a lodge-like feel, with antique pine floors, a two-story stone fireplace, and high beamed ceilings. Its location on the point makes it handy for water sports, though many guests come for golf. The small on-site spa is quiet and serene, with treatments starting at $45. Dining options include the Grand Steakhouse and the more casual Saltwater Grill. The breakfast buffet is impressive, but we also savored the complimentary afternoon tea, when guests flop everywhere to read a newspaper or plan their next excursion. Alabama Golf Trail Golfers can choose between the Dogwood and Azalea courses at Grand Hotel’s Lakewood Golf Club, and we enjoyed both. 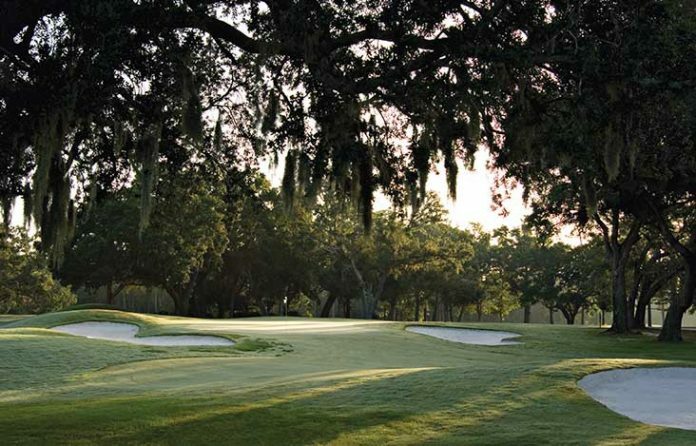 Established in 1947, the club blends the maturity of stately tree-lined fairways with excellent playing conditions, thanks to recent course renovations. Fox squirrels, turtles, and a variety of birds will appeal to nature lovers, and history buffs should take a peek at the Confederate cemetery next to Azalea’s eighteenth tee. Lakewood is the newest stop along Alabama’s acclaimed Robert Trent Jones Golf Trail, known for high-caliber golf at reasonable prices. Stop at any of the trail’s eleven sites, and you’re within an easy drive of another. Guy’s Style Today’s golfers may dress like Rodney Dangerfield in Caddyshack, but they won’t sweat like him. New high-tech shirts have sunblock and ventilation, and don’t hold and odor, says Erin Kreutz, director of retail for Mosaic Clubs & Resorts, which manages courses such as the Golf Club of Georgia and St. Mario.